that can set the stage for improved surgery and also phototherapy. Researchers have developed a new way to selectively insert compounds into cancer cells - a system that will help surgeons identify malignant tissues and then, in combination with phototherapy, kill any remaining cancer cells after a tumor is removed. It could be as simple as "if it glows, cut it out". The findings, published in the journal Nanoscale, have shown remarkable success in laboratory animals. The concept should allow more accurate surgical removal of solid tumors at the same time it eradicates any remaining cancer cells. In laboratory tests, it completely prevented cancer recurrence after phototherapy. 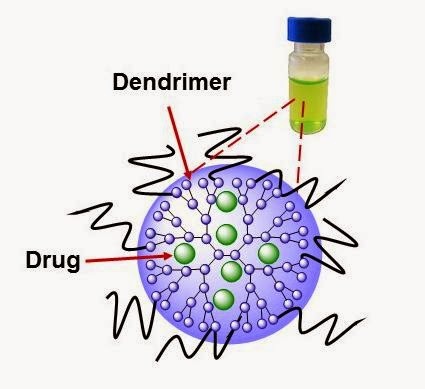 The experts overcame these problems by use of a special water-soluble polymer, called a dendrimer, which allows the napthalocyanine to hide within a molecule that will attach specifically to cancer cells, and not healthy tissue. The dendrimer, an extremely tiny nanoparticle, takes advantage of certain physical characteristics that blood vessels leading to cancer cells have, but healthy ones do not. It will slip easily into a tumor but largely spare any healthy tissue. For many cancers, surgery is a first choice of treatment. This research may help make that surgery more precise, effective and thorough than it's been before. Before attempting human clinical tests, the researchers hope to perfect the process and then test it on live dogs that have malignant tumors. The technique has already been shown successful in laboratory mice. The researchers noted that even as phototherapy was destroying their malignant tumors, the mice showed no apparent side effects and the animals lost no weight. Originally posted by Oregon State University.